After a year of being out of commission, 3 mechanics and 1.5 paychecks later... my beloved motorcycle is back on the road. The carbs took so much time to clean, I might have been better off trying to find a used set somewhere. Now they tell me. It was in dire need of some TLC after just riding it for 10 years. Many guys have adolescent dreams involving exotic machines. For some boys, their fantasies included an outrageous Lamborghini Countach, or a historic P-51 Mustang fighter or a chromed out muscle car. While I certainly dig all those things, I knew I would never own one. Instead I chose two wheels. 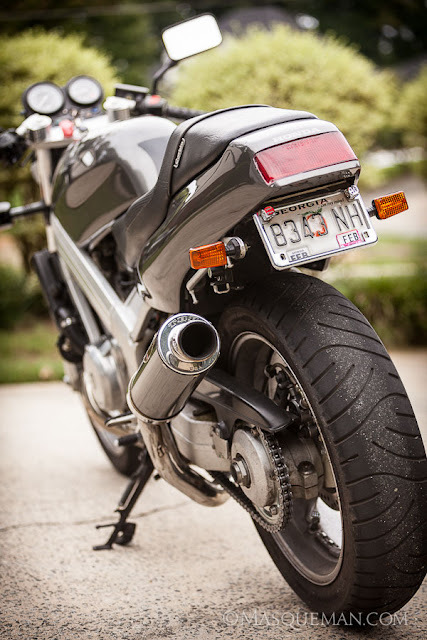 For me, it was the 1988 Honda Hawk (RC31) motorcycle that caught my eye and imagination. The lines on this bike make it a modern classic. 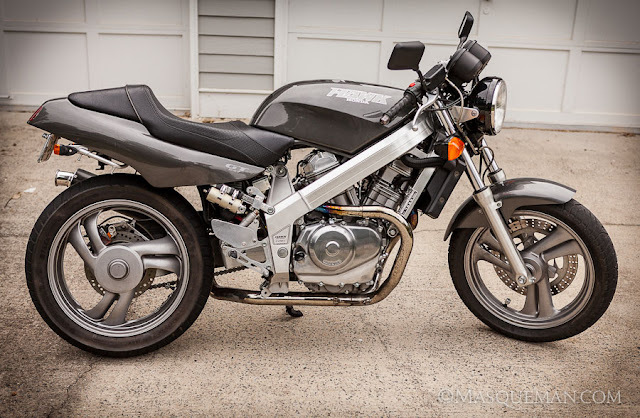 In my mind, it would also become a time capsule of my art school days when I would blast around Richmond, Virginia with hooligans on kickstart Kawasakis and Suzukis in leather jackets and combat boots. Visualize vintage Mad Max style motorcycles like the ones to the left and you start to get the picture. 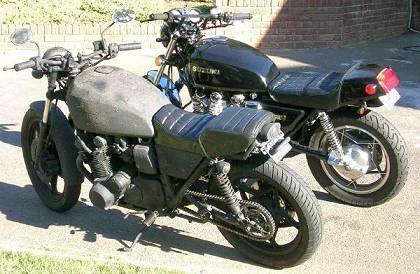 The blacker and junkier, the better.... hence the nickname "rat bikes". The Hawk is no rat bike though. It's too nice for that, but the hooligan spirit is there. It is considered a "naked bike" before the industry came up with such a name. They echo back to the 1960s cafe racer bikes of Norton and Triumph with long tanks, single seats and low bars. 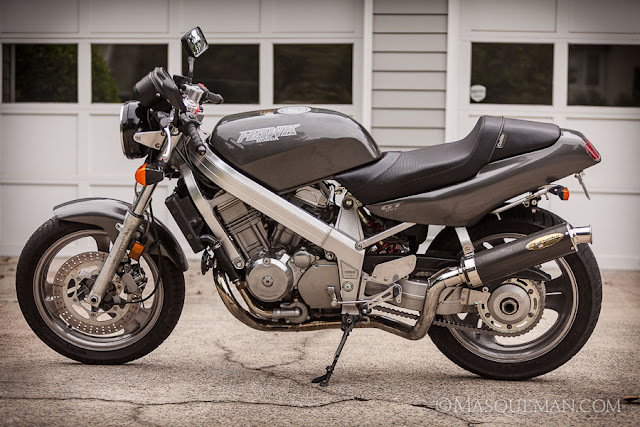 They only go about 120 mph, but they are sublime in the curves and able to keep up with much more powerful and modern motorcycles. There are no secrets hidden here. One can see welds, bolts, bluing on the exhaust pipe and several shades and textures of silver metal. 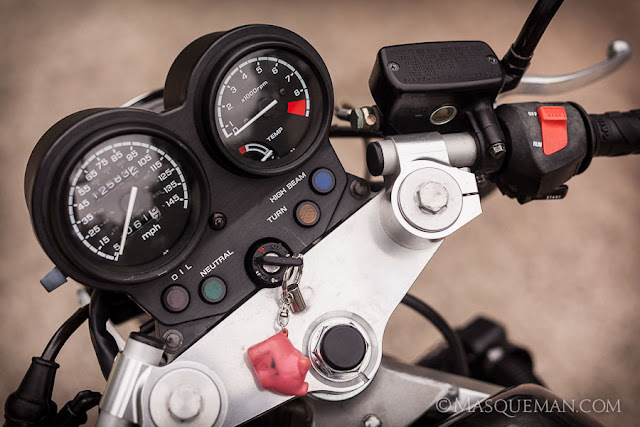 It is an honest machine of deceptively simple design... 2 wheels, 4 spark plugs, 2 cylinders, 1 exhaust pipe and 1 swing arm.... yes, just 1. This rear wheel appears to float when viewed from one side because Honda chose to use a single-sided "Pro Arm" suspension derived from exotic Grand Prix technology. 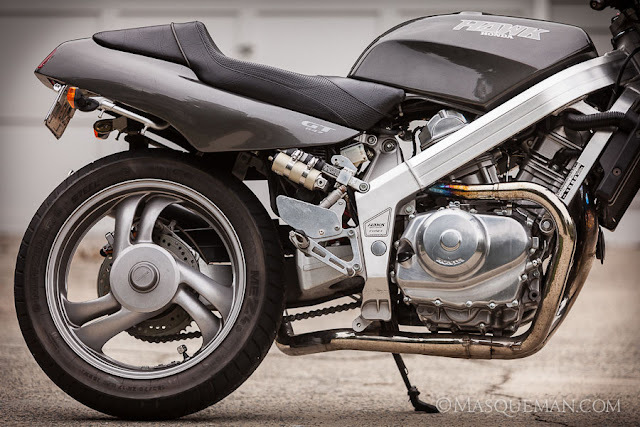 Most motorcycles have 2 swingarms that sandwich a wheel so this is pretty unique. Unlike modern motorcycles, this one has a sensibly sized rear wheel... not a oversized fatty tire like those silly TV choppers. For some reason, Honda originally chose to cover the "floating wheel" with a very ugly exhaust pipe that looked like a coffee thermos as seen in the inset. My exhaust was rerouted to the left which gives the illusion of a detached wheel. 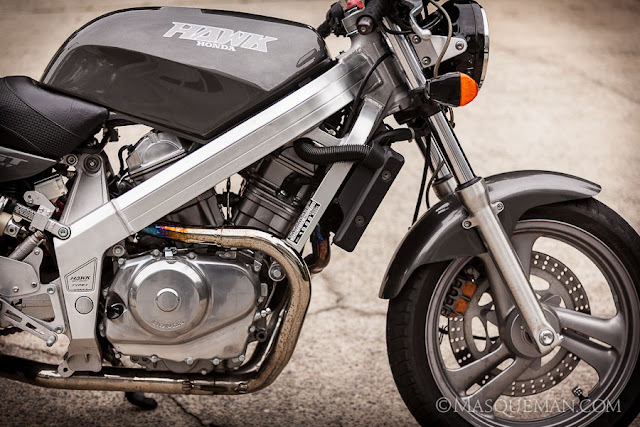 Below you can see the rerouted exhaust, the custom seat, custom foot pegs and the lower clip-on handlebars that give it the cafe racer look. This engine is a 650cc V-twin and it has a great throaty rumble. It could really wake the neighbors if I were to open the throttle too much. The carbon fiber canister really barks nicely. The exposed frame is a mixture of extruded and sand cast aluminum parts. The design still holds up today and I was surprised at a local bike gathering when a small crowd gathered around it. They knew that they were looking at something special. They only made them for 3 years and many were converted to track bikes to be abused and wrecked. I wonder how many still exist today? This is my view from the cockpit. Simple controls and analog dials... just like they should be. The keychain has a tiny pink pig because this is my version of a "hog". Less than 13K on the odometer. 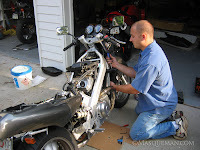 Many years ago when a friend worked on the bike, we discovered white rice in the air box. This is a mysterious thing to find in a motorcycle and my imagination went wild. Assuming that was the original air filter, I theorized that the Honda assembly technician dropped some of his lunch. Or maybe it was used in a hooligan wedding? What if a Shinto priest placed sacred rice into it to give it special powers? What ever the reason was, I now know why I secretly Asian food whenever I ride it.